The Illinois legislature moved the date of the state's presidential primary (and that of state and local primaries as well since all are held concurrently) from the first Tuesday in February to the third Tuesday in March when the elections had been held prior to 2008. The main motivation behind the legislation (SB 355) was to move the other primaries back to their original date so as not to lengthen the general election campaigns for other offices. Apparently the financial hit that would have been caused by separating the presidential primary was too steep. Illinois is also one of the states that has always insisted on having both sets of contests held together. That also makes Illinois one of the rare states to have both held their all their primary elections at once and moved to an earlier date on the presidential primary calendar. 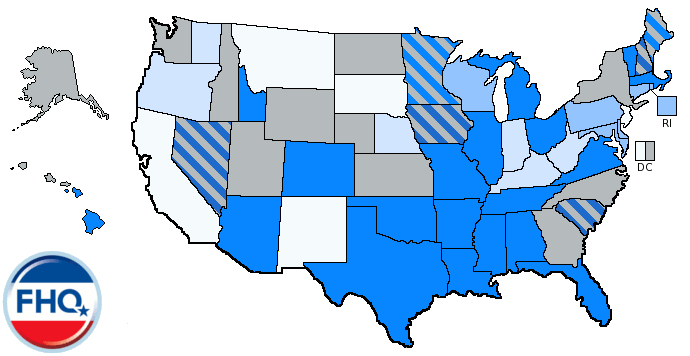 Rare may be a bit strong, but those states with separate presidential primaries -- separate from those for state and local offices -- are much more likely to move and have moved their contests in the post-reform era. Montana Republicans just recently opted to forgo their scheduled February 2012 caucus and take advantage of the state-funded primary. 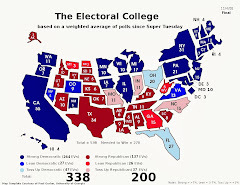 The influence they sought by moving to February in 2008 was lacking with over half of the country either voting on or before that February 5 date on which the GOP caucus was held in Montana. Not unlike Arkansas, Montana Republicans didn't find the greener (more influential) pastures in 2008 they thought they would when the moves were made. The New Hampshire General Court did not settle on a date for 2012 -- that's up to Secretary of State William Gardner anyway -- but they did act to protect the state's first-in-the-nation status by tweaking the Granite State's election law. HB 341 carried over from last year and was passed, though in a modified form. The version from 2009 contained more specific language implying that only Iowa could precede New Hampshire on the calendar. That segment was missing in the 2010 version, replaced with the line, "The purpose of this section is to protect the tradition of the New Hampshire first-in-the-nation presidential primary." The bottom line is that New Hampshire will be among, if not the, last state to decide the date on which its 2012 primary will be held (...or if it will be held in 2012 at all. No, FHQ doesn't think that's a possibility, but time will tell.). 2. Of most interest to those following this calendar shaping process is what the parties decide on in terms of rules later this summer. If both parties, as expected, call for a return to pre-2004 timing rules (read: no February contests for non-exempt states), the focus will shift to those states that will have to move their contests in order to comply with the new rules. That count now sits at 18 primary states and one caucus state, not to mention the four exempt states (Iowa, New Hampshire, Nevada and South Carolina). 3. I've gotten several comments on a "recent" post I wrote about the 2012 rules and calendar. Let me make clear that that post was an exercise that assumed the exempted states opted to move first in the process by voluntarily accepting the proposed scheduling rules. 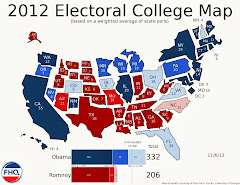 Under that scenario, Florida would be in the catbird seat: first but in need of a change to comply with the new rules. This will not happen. Florida may opt to stick with that last Tuesday in January date, but Iowa, New Hampshire, Nevada and South Carolina will make their scheduling decisions after Florida has acted, or not acted, on their date. More than anything that post was to serve as a visual for why Florida should flaunt the rules again in 2012. This is out of FHQ's wheelhouse, but we have, like many others, been intrigued by the events surrounding the Democratic nomination race for Senate in South Carolina this week. To a fault -- or perhaps not -- I have been trained to both resist simple answers and play devil's advocate. At the same time, I'm also hesitant to latch onto conspiracy theories. In other words, FHQ has not subscribed to either the alphabetical order argument nor does it necessarily accept the "Republican plant" argument that Jim Clyburn has been pushing the last couple of days. To me, something else is up with this race and it rests somewhere in the middle of those two extremes. "And I’m not sure that the potential ballot order effect is implausibly large. Assume for the moment that voters were essentially choosing at random between the candidates. That would imply a 50-50 outcome. The actual outcome was 58-41, which only implies that 8-9% of voters were influenced by ballot margin." The only thing that bothers me about that line of reasoning -- and I find it sound -- is that the 2008 Senate nomination race, as folks within the South Carolina Democratic Party have pointed out, was between two equally unknown candidates statewide and the result was a near draw. However, if one is looking for ballot order effects between two unknown candidates, the 2008 race may have been mitigated by the fact that both candidates had very similar last names. Michael Cone and Bob Conley. Conley won 50.36-49.64 and went on to lose to Lindsey Graham in November. So what else could explain the out-of-nowhere performance Alvin Greene turned in on Tuesday? Some have speculated that race was also a factor; that somehow Greene's name may have tipped off voters in a primary electorate that is overwhelmingly African American. Again, this one is tough to isolate. Sides also examined the relationship between the share of the vote that Greene got across each of South Carolina's 46 counties and the percentage of each county that was African American in the 2000 Census. There was a slight relationship there, but as Sides points out, it wasn't statistically significant. But let's try and find some middle ground between the simple explanations and the conspiracy theories. This one is just too fishy to me, and here's why. If one wants to find some irregularities, one has to go looking for them. My thought was to look at the turnout numbers from Tuesday. First of all, Greene lost four of 46 counties statewide and cleared 60% in 29 of those 42. That seems more systematic than random. But let's assume that it was random for a moment and keep poking around. The other oddity is that turnout among Democrats was actually up compared to the Democratic primaries of 2006 and 2008. Those two elections were -- at least nationally -- cycles that favored Democrats while 2010 does not. The numbers in 2010 were actually comparable to the Senate race in 2004 which saw Inez Tenenbaum, the state's Education Superintendant, emerge with the nomination. But she was a known quantity while neither Vic Rawl nor Alvin Greene were in 2010. Fine. Turnout was up in an otherwise down year for Democrats (nationally). So what? That doesn't mean anything is going on in South Carolina. No, it doesn't, but let's have a look at the county by county numbers (click on View All Data) in 2010 versus 2008 and see if there is any pattern to the vote increases. The problem here is that the raw vote totals in each county cannot be used. What I did then was look at each county's share of the statewide Democratic vote total in the Senate primaries in each election cycle. This percentage is a means of pseudo-standardizing the measure. The 2008 percentage was then subtracted from the 2010 percentage. In turn, that gives us an idea of which counties increased their total vote shares the most. My thought when I started this exercise was that if any ballot boxes were going to be stuffed (or machines tampered with), the best place to hide it would be in high vote areas. 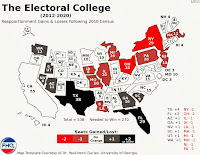 I quickly glanced through the data for all 46 counties and saw that a disproportionate number of the gainers -- those states that gained the greatest share of the vote from 2008 to 2010 -- were the most populous states. In fact, of the top ten gainers, seven were among the top ten most populous counties. Additionally, the gains across all of the top 10 most populous counties (distinct from the top ten gainers) accounted for over 24,000 votes or about 80% of the more than 30,000 margin by which Greene won. While this seems to indicate that something might be amiss in the most population dense areas of the state, there are two big problems with this experiment. 1) Now it is true that there seems to be a pattern here; that more populous counties were more likely to see above average gains in their share of the statewide total. But that just accounts for the difference between 2008 and 2010. What if that is a typical trend from cycle to cycle? As a simple check I did the same exercise but compared the difference between the Democratic Senate primaries of 2004 and 2008 (see footnote below for explanation on 2006). The population-based pattern exhibited in the changes from 2008 to 2010 was non-existent in the change over from 2004 to 2008. The latter had no real detectable pattern and indeed looked quite randomly distributed. In the 2004-2008 example, only three of the top ten most populous were among the states that gained in terms of their share of the statewide vote from one Senate cycle to the next. There may be something here. 2) There may be something here, but we've left out one important part. It's fine for those counties to have gained a larger share of the total statewide vote from 2008 to 2010, but how did Greene actually perform in those counties? This is where the wheels come off this explanation somewhat. Greene actually underperformed his statewide average of 59% in the ten most populous counties. The mystery candidate garnered only 57.5% in those ten counties. The raw votes increased, in other words, but that didn't translate into Greene or someone acting behind the scenes stuffing the ballot box on his behalf. Is this the end of the road for this idea? No, I think there still may be something here, but that there needs to be a greater focus on some sort of an interaction between the percentage urban and percentage black for each county. If there is a large degree of overlap between the two, that likely punches some holes in the racialized argument. But South Carolina is still part of the South and urban doesn't necessarily mean black in the way it does in other states with major metropolitan areas. If there is some conspiracy here, whoever is behind it left some clues behind but didn't make anything easy on the slew of political scientists who are acting like CSI forensics experts with this thing. In the meantime, FHQ will keep digging and let you know if we turn up anything more. *There was no Senate race in South Carolina in 2006. These numbers are from the top of the ticket race for the Democratic gubernatorial nomination. Update: Tom Schaller over at FiveThirtyEight has much more.